The Taj Mahal is undoubtedly the most famous monument of India. Every year, thousands of tourists come to visit this white marble tomb located in a spectacular garden. The Taj is a source of attraction for tourists for various reasons: it is one of the greatest monuments in the world, one of its seven new Wonders, it is associated with eternal love and is one of the greatest assets of India. Few are those who, after having discovered the tomb and its garden, remained of marble. And it is precisely marble that makes the mausoleum, white marble that takes, depending on the time of day and season, different colors, which makes it simple even more beautiful. The information below explains the historical context in which the Taj Mahal was created. According to the Timurid tradition the Mughals were great patrons of the arts, whether for painting, architecture or more luxurious arts such as jade carving, textile production, jewelry, metal objects, military paraphernalia etc. The other contemporary Muslim dynasties of this period, the Ottomans of Turkey and the Safavids of Iran also engaged in similar productions because their productions, bought by the elite of their peoples, made it possible to assert the superiority of their empire by compared to others. But the Mughals, more than any other Islamic civilization, engaged in the construction of tombs, especially during the late sixteenth and early seventeenth, a time of construction of the Taj Mahal. The construction of tombs was a common practice throughout the Indian subcontinent since the tenth century in what is now Pakistan, a place where Muslims had assumed political authority since the eighth century. The leaders of these regions settled in northern central India in the early 13th century, so they imported this tradition of building mausoleums for their leaders and elites. Then the Mughals appropriated a large part of the North-Indian territory, so the growing number of the elite required the construction of a lot of mausoleums, whether for leaders from the army or the administration. . This multiplication of mausoleums in North India was also favored by the exception to a rule that when a landowner died the land was to be restored to its natural state. This rule did not apply if the land in question had a mausoleum, so the multiplication of the mausoleums was physically visible, since it was never demolished. The first major tomb project was that of Humâyûn, Akbar's father. Built in Delhi, near the shrine of a prominent Muslim saint, Nizamuddin Auliya, he is now known as Purana Qila. The tomb of Humâyûn was completed in 1571. It was designed by Bukhara father and son who defined an architecture both urban and natural. This large dome-shaped structure is an octagon Baghdadi, which is an octagon with four alternating sides long and short sides. It is on a high terrace in the middle of a garden. From a general point of view the design of the garden belongs to the Timurid tradition. Inside also, it consists of a central chamber surrounded by eight smaller rooms in a plane known as hasht Bihisht where these eight rooms represent eight timurid-inspired paradises. It is built of red sandstone and decorated with white marble trim, all in the tradition of Northern India. Placing the tomb in a garden is probably a Mughal innovation. The garden can be seen as either an earthly paradise or a symbol of political control. According to Timurid tradition, the tomb of Humayun was probably designed as a dynastic tomb because even if no other emperor is buried there, this was the case for a number of members of the royal elite. When Akbar died in 1605, Jahângîr started his funeral complex on the outskirts of Agra, now known as Sikandra. Like Humâyûn's Tomb and later, the Taj Mahal, Akbar's Tomb is also located in a complex formed of a walled garden with waterways that divide the complex into four main units. The tomb, as well as the one built for Jahângîr in Lahore later, has no dome, but its upper terrace is left open, according to a readable passage as inscription of the tomb: "That the soul [Akbar shines like the rays of the sun and the moon in the light of God ". An element in common with the Taj Mahal is the accessible underground crypt where the deceased is buried. Indeed in the Muslim tradition the dead must be buried in the ground. The cenotaphs found on the floors are perfect copies, it seems, of the basement tombs. All the imperial tombs have inscriptions on the entrance door to the complex, and Akbar's tomb is no exception. There are two characteristics of its grid that reappear on Taj Mahal. 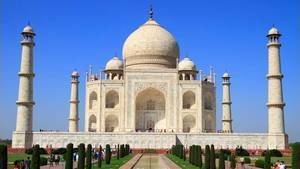 One is that the four minarets of white marble mark the corners of the entrance; both at the tomb of Jahângîr and the Taj Mahal where similar minarets will be placed not on the entrance but at each corner of the terrace. The second feature is the long inscription that embellishes both sides of the door. It is a Persian poem written especially for this monument and designed by the calligrapher Abd al-Haqq Shirizi, who was honored with the title Amanat Khan. The poem praises the late Emperor Akbar and ends with verses inviting the visitor to enter the garden of paradise. While the Mughal imperial gardens, especially those of the tombs, are generally associated with visions of paradise, this poem on the entrance door of the complex makes this reference clear. Paradise, in Islam, is the reward for the true believer on the Day of Judgment. The tombs of the most important Sufi saints, and more particularly the tombs of the Saints Moinuddin Chishti at Ajmer and Nizamuddin Auliya at Delhi, were made of white marble, a material which was associated with purity, and by extension with holiness. So over time white marble was used to make the tombs of the great of the Empire and members of his immediate family. The rest of the people did not have access to such material, of course, to be able to distinguish the Emperor and his family. Jahangir's queen, Nur Jahan, built for his mother and then his father (who died soon after) a white marble tomb richly encrusted with multicolored stones. Nur Jahan's father was Shah Jahan's finance minister, he was very close to Jahangir, but no royal blood. It is thanks to this proximity that he could have such a tomb. Although this tomb was built for the couple, it is known as the tomb of Itimad-ud-Daula, according to the father's official title. It was completed in August 1626, and like the other Mughal imperial mausoleums, it lies in the center of a fortified charbagh and its ground floor conforms to the hasht. The inner part consists of a closed central chamber with finely carved panels, all capped by a truncated pyramidal vault. Each corner of the terrace is equipped with a short minaret. While this complex is smaller than all the tombs intended for an emperor, its marquetry decor gives the structure an unprecedented elegance. Not surprisingly, there are floral and geometric designs, but more surprisingly the visitor can see pictures of cypresses, fruits of other plants. This imagery, drawn from classical Persian poetry as well as the Koran, is intended to consider the complex as a Paradise. The architectural element that best represents the ascent to Paradise is the white marble dome. A dome is associated, in Mughal imagery, with the ascent to Paradise. Nowadays the Taj Mahal complex and its garden seem to be the only ones along the Yamuna River, but in the Mughal era there were several gardens bordering this river, however, it was the only one to be present on the two banks. On the south side is the mausoleum and the garden, while on the north side is the Mehtab Bagh, also known as the Moon Garden, with its reflecting pond. Most visitors to the Taj Mahal think that the Taj Mahal is the marble tomb, possibly thinking of its garden, but in fact it's more than just a building, it's a complex, almost a an independent city in Agra, then Mughal capital and officially known as Akbarabad.